Does Your Biz Card Work For You? Here’s the senerio, you’re at a “networking event” and you’re approached by a fellow competitor who asks for your business card. If you’re like many people I talk to, you reluctantly take out your card, hand it to them, hoping to hear, “wow that’s a great card.” Most of the time let’s face it, putting yourself out there on a piece of paper isn’t easy. 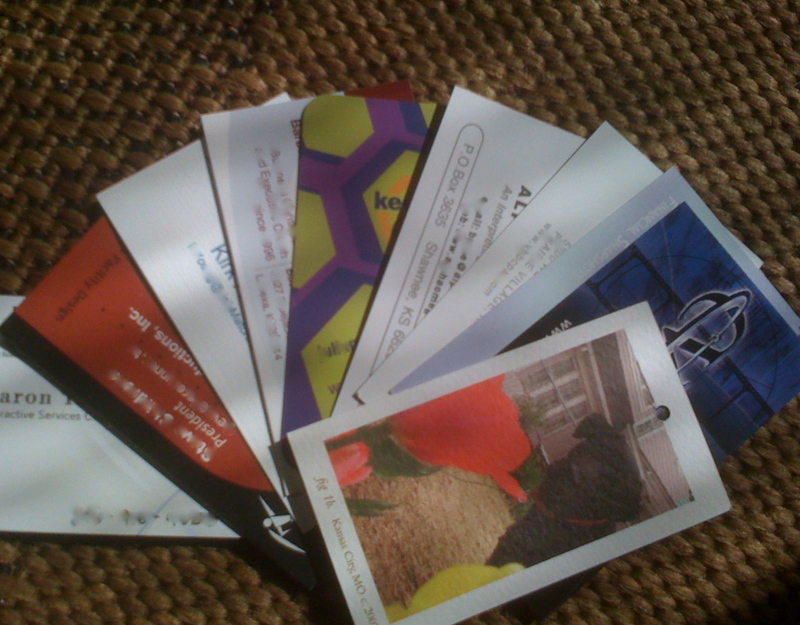 So why do many people cut corners when it comes to business cards? After all, this is the first impression many potential clients have of your business. Think about giving out your card this way. As the recipient puts the card in their pocket, they now have a tangible impression that they can hang onto and refer to when needing an expert. So what you have to say and how you say it better be memorable. What makes a card stand out? Yesterday I was at a networking event and collected a few cards and I also threw in some cards I have picked up recently. Take a look at what I found. Now I understand that in some industries this color/unique shape is an easier sell than others. For instance, if you focus on a highly corporate target market, a card that is purple with a flying pink pig, might not be a good idea. But that’s just it. It’s not just the design, it’s getting your brand out there. Who are you? What do you do? Is that clearly stated on your card? At the end of the day, does your card pass the trash test? Need some inspiration? Check out Flicker! Or if you have the design already in you mind you can create some unique cards at Moo! Share your cards with me, I’d love to see what you create to make a lasting impression!